The Chifley on South Terrace Hotel is located opposite the South Terrace Parklands and within walking distance to the heart of the city centre. The hotel is only 6 km from the Adelaide Airport. The Chifley on South Terrace Hotel offers guest a wide variety of accommodation with all the modern amenities available at their fingertips. Room facilities provided by Chifley on South Terrace include air conditioning, cable TV, pay per view movies, mini bar and internet access. Other premium hotel facilities offered are complementary parking, fitness centre, 24 hour reception desk, room service, laundry facilities and an outdoor pool. Four function rooms with fully equipped audio visual services can cater for weddings, conferences or events. The Kurrajong Restaurant and Bar is famously known for its creative dining options and wines, which makes for a very enjoyable experience. The Chifley on South Terrace is a fully non-smoking hotel. 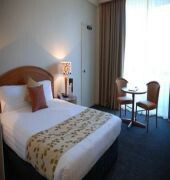 The accommodation is suitably located for guests to explore the beautiful city of Adelaide, the Adelaide Hills and the Barossa Valley for their famous wineries or take a tram to the famous Glenelg beach. Guests can enjoy the famous festivals, art galleries, museums and river cruises venues all within close proximity to the Chifley on South Terrace Hotel Adelaide.